Building a startup as an entrepreneur is exciting, but surely not the easiest of endeavours. There are many challenges to overcome. On top of that list is ‘Managing time’. As a business owner, you have a lot of areas that demand a chunk of your typical 16-hour day (24 minus 8 hours of sleep!) : work time, learning time, family time, meeting time and lets not forget the commuting time. 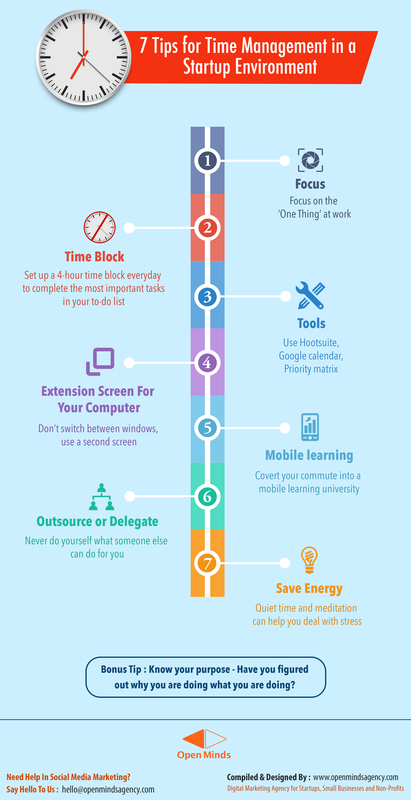 So how do you deal with all these time-demands and manage time? Here are 7 things that I recommend to make the best use of your time. One of my friends shared this insight with me. Focusing on the ‘One Thing’ in life. In your work life, you might be good at ‘one thing’, or there may be this ‘one thing’ that is critical for the success of your business, without which all else could be a waste. So, try & focus your time on that ‘one thing’. And till you get that ‘thing’ right, don’t commit any substantial portion of your time to anything else. For example: As a startup, you might get opportunities to consulting for other startups, to network & connect with others in club meetings, interesting meetups, conference invites, etc. Don’t get distracted with all these seemingly-important activities that do not fit into your current plan (atleast until you finish your ‘one thing’!). Learn to say “No”. Set up a 4-hour time block everyday to complete the most important tasks in your to-do list. That is ‘your’ time. No phone calls, no disturbance from anyone including family. Make sure that people close to you are aware that this is the time you will not take any interruptions. Find an ideal time-block where usually no one needs your support, except for emergencies. This uninterrupted block of time allows you produce the best work, learn in-depth about your field of choice and become a master at what you are doing over a period of time. Having said that, I am still at it. The trick is to start with a one-hour block and slowly increase it. Make sure that you use the right tools to manage your activities. There are proven facts that these tools save hours of your week, if not days and that is precious for you to focus on other activities. For example have a tool to manage your social media. All of us spend time on Facebook, Twitter, Linkedin, etc. Use a tool like Hootsuite to help you save time. Use a simple organizer or a diary to help you time block for your one thing. Or you can use an app like Google calendar or Priority Matrix to help you do that. For me, it sure saves a lot of time. Especially when I have to respond to emails, while I am working on that important research or attending a webinar. This is a simple facility but very effective. I am not referring to your phone. This is about converting your car or your mode-of-transport into a mobile university. Start using audio learning material available on CDs and podcasts. These days podcasts are available for everything you need to learn or keep yourself updated. Use your travel time for this. This is something I learnt from my ex-boss. Don’t do anything which someone else can do for you. Employ a helping hand or a pro-cleaning service provider who can help you free precious time of yours. Drop your obsession over getting your clothes ironed by yourself or washing your car. May be you could combine your shopping list with trips that other family members or friends might make to the shopping mall or try to make most purchases online. Walking up and down the aisles of a shopping mall may not be the best use of your precious time! The last point is not about saving time but saving your energy. I do that by my quiet time & meditation. As an entrepreneur, that too in startup environment, its important for you to learn and practice the art of quietly focusing on your priorities and purpose for each day. Meditation helps you zoom out of the daily action and helps you put every aspect of you life in the right perspective. You might deal with multiple tasks with time pressure. For example, the ones involving finances are usually very stressful. Having a quiet time everyday and meditating helps you deal with that stress. If you are not in a position to follow any of the first 6 tips, I would suggest that you to consider this 7th point to keep yourself from going crazy under pressure. This question could be a real bonus for some. Have you found out why you are doing what you are doing? Yes, its the most important question: Why? Are you willing to sacrifice everything else for what you are currently doing? Will you be ready to do what you are doing, even if you were not paid for it? Does the work you do make time stand still when you are at it? Does your work keep you fresh even after a long day? Finally, is your startup part of your overall purpose in life? As you might already know, a startup environment tests every ounce of strength in your body, your mind and your soul. And sometime things might go wrong. That is the time you need to pull up your cuffs and put your shoulder to the wheel. You will be able to do that only when you answer this ‘Why?’ question and know that your work is part of your life’s purpose. So if you have not done that already, find your purpose at work. When everything else fails, purpose will help you move forward. If you have any more thoughts on this or if you have other time related tips that have worked for you, leave your comments below. I would appreciate it. All the best with your startup venture! See you at the top!